YOU’VE HEARD THE TERM, but what exactly does the word “superset” mean? Traditionally, a superset is two or more exercises performed consecutively to work opposing muscle groups. “These days, the term has been used a lot more loosely,” says Gold’s Gym Fitness Institute trainer Adam Friedman. 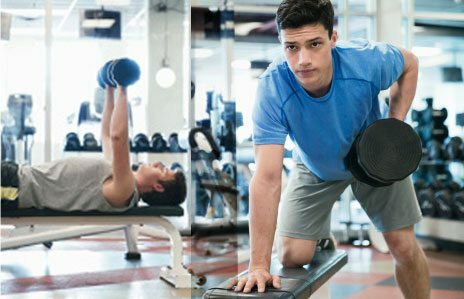 “I tend to follow the traditional approach myself.” Supersets increase intensity level, heart rate and calories burned because you are doing two exercises consecutively. Plus, they amp up your mental toughness with more challenging gym time, and you have to push yourself to do continuous sets with less rest. “I enjoy doing them because it’s more challenging from a conditioning standpoint, it’s time efficient, and it’s an excellent way to work opposing muscle groups to keep balance,” says Friedman. In a healthy body, the muscles that move and stabilize the bones have a natural reflex to relax when their opposite muscles are working. Doing supersets can help guarantee that you’re working all your muscle groups. Here are five supersets you can use to supersize your routine. Beginners should start with three sets of 5 to 8 reps, while more experienced gymgoers can try three sets of 10 to 12 reps. Count to three on the way down, and go back up on two. “At the beginner level, the weight lifted during a superset should be a little lighter than what you would normally use during an exercise,” Friedman says. “This is just for safety reasons until you become better mentally and physically.” Intermediate to advanced should use the same weights you typically do with an exercise to maintain their strength levels, which may mean that they go down in repetition to start, but then increase as conditioning improves. Begin by lying on a flat bench, feet flat, knees bent at 90 degrees, arms extended upward at shoulder width with dumbbells in hand. Squeeze your shoulder blades against the bench and lower the dumbbells level to your chest. Stand in a split stance, bend over until your back is parallel with the ground. Keep back in a neutral alignment, arms fully extended with dumbbells in hand. Pull dumbbells up to waist. Begin by lying on an inclined bench, feet flat, knees bent at 90 degrees, arms extended upward at shoulder width with dumbbells in hand. Squeeze your shoulder blades against the bench and lower the dumbbells level to your chest. Sit on a pull-down machine with a wide bar attached to the top pulley, legs at 90 degrees. Grab the bar just outside shoulder width. Pull bar down to the top of your chest, bringing your shoulders down and back. Stand with feet hip distance apart, knees soft, dumbbells in hand. With elbows straight, extend arms above head. Lower dumbbells to earlobes. Mount the assisted pull-up machine. Grab bar, lower body down, extend your arms, and pull up, aiming your chest toward the sky. Begin by lying on a flat bench, feet flat, knees bent at 90 degrees, arms fully extended above shoulders with dumbbells in hand. Bring arms down to your side, with a slight bend in your elbow. Straighten elbows and squeeze your chest muscles on the way back up. Begin by lying chest down on an incline bench, feet flat, knees bent at 90 degrees, arms fully extended with dumbbells in hand, thumbs facing down. Bring arms out to your shoulder. Stand with knees soft, feet shoulder-width apart, with dumbbells in hand. Press your elbows into your sides. Bring the dumbbells ¾ of the way up to your shoulders. Stand with knees soft, feet shoulder-width apart. Keep your elbows stationary for the full move. Grab the bar and extend you arms downward to fully contract your triceps. Pause for one second at the bottom of the movement before bringing arms back up to the starting position.